with several former London Transport Routemaster buses (plus a few newer ones) providing a bus service from Warminster Station to Imber and to other isolated locations on the Salisbury Plain. 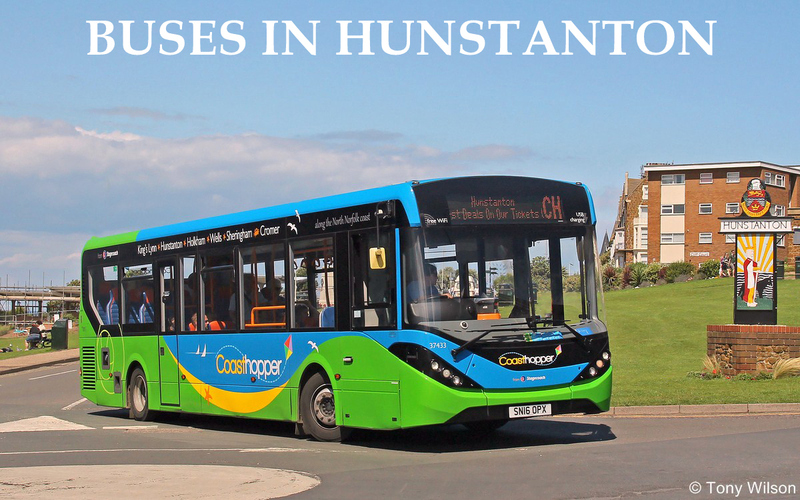 As the buses will be operating an ordinary bus service, there is no need for passengers to book in advance – just turn up and pay the conductor on the bus. For details of this year’s event, please click here to visit the Imberbus 2017 page and download a copy of the timetable. You can also find out more information about Imber and Imberbus by checking out the other pages on their website. Far away from the flat plains of Wiltshire, the town of Hunstanton lies up in the top left hand corner of Norfolk, where The Wash meets the North Norfolk coastline. Two bus companies vie for passengers in the town, Lynxbus and the Stagecoach East subsidiary, especially on the routes 10, 11 and Coasthopper CH (Stagecoach) and 33, 34 and 35 (Lynxbus), which operate by various routeings between Hunstanton and King's Lynn. Both operators have bases in the latter town. Stagecoach's Coasthopper CH route also continues a considerable way along the coastline via Well-Next-the-Sea and Sheringham to Cromer. A selection of images have been placed into the latest album which can now be viewed by clicking here . Oh yes, and look out for one other wheeled oddity, which drives up and down the coastline just below the waterline.